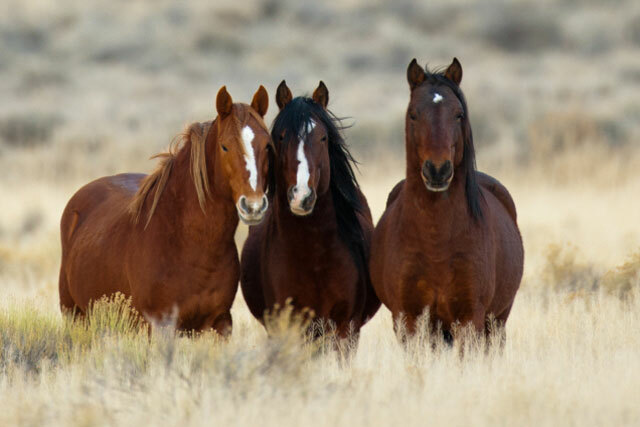 In 2000, Return to Freedom collaborated with the US Fish & Wildlife Service to relocate more than 50 wild horses in their intact family herds from the refuge. They were threatened with a helicopter roundup. Due to pressure from Return to Freedom Wild Horse Sanctuary a far more humane horseback roundup was carried out instead. Today the Sheldon refuge plans to continue to remove all wild horses from the refuge. Seven stallions arrived at Return to Freedom in 2000. Some arrived with mares in harem bands and some as part of a small group of males called ‘bachelor bands.’ These horses are descendent from a combination of draft horses who worked hard to develop ranchos in Nevada’s Great Basin and cavalry horses raised in that region during the 1920s and 1930s. Many of these horses were turned loose and left to survive the rough terrain and varied weather of the Sheldon Refuge area alone. They have returned to a natural state and survive some of the most inhospitable regions of our federal lands in the Northwestern United States. The Sheldon National Wildlife Refuge is 575,000 acres in the Northeast corner of Nye County, Nevada. Horses in the Sheldon Herd are in need of sponsorship, too. Please consider sponsoring a Sheldon Horse. We can’t do this work without you. YOU make it possible for Return to Freedom to save horses who have been removed from their home in the wild and offer them a safe haven where they can live out their lives in large pastures with their herd groups. Our Sponsor a Horse program is an automatic monthly donation program. It only takes a moment to sign up and your debit or credit card will be automatically billed each month. You can cancel at any time.